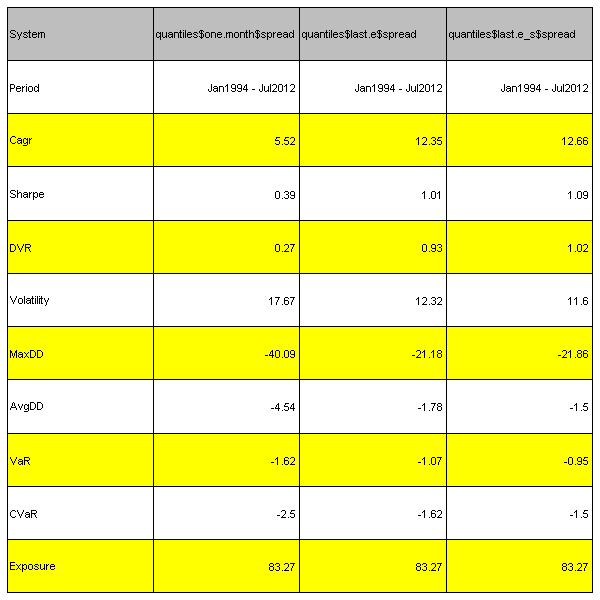 I encourage you to read more about various time series models available in R and share your examples of Forecast Dashboards. To view the complete source code for this example, please have a look at the bt.forecast.dashboard() function in bt.test.r at github. In my last post, Factor Attribution to improve performance of the 1-Month Reversal Strategy, I discussed how Factor Attribution can be used to boost performance of the 1-Month Reversal Strategy. Today I want to dig a little dipper and examine this strategy for each sector and also run a sector-neutral back-test. 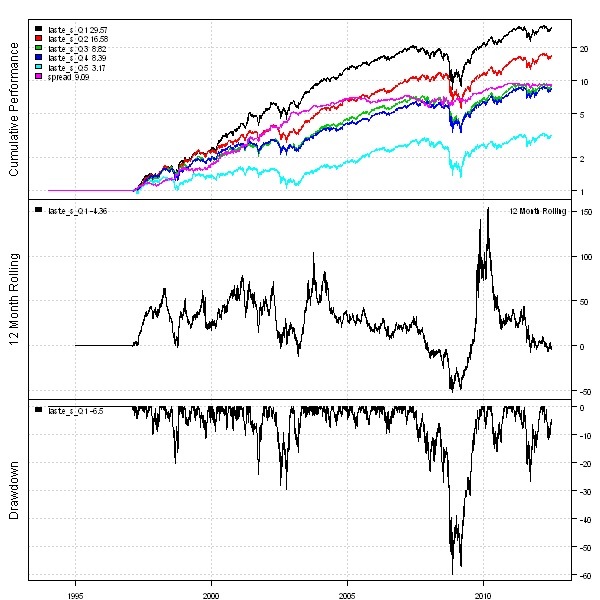 I have compared below, the overall and sector-neutral versions of the strategy based on the 1 Month returns (one.month) and the Residuals from the Factor Attribution regression (last.e_s). In all cases the Residual strategy outperformed the base one and also the sector-neutral versions have better risk-adjusted coefficients compared to the overall strategy. Next I looked at the each sector performance for both strategies and surprisingly found that Energy, Materials, and Utilities underperformed in both cases and Financials and Consumer Staples did very well in both cases. Looking at the sector back-test charts, I think the Momentum strategy that selects top few sectors each month would do very well. You can try implementing this idea as a homework. To view the complete source code for this example, please have a look at the bt.fa.sector.one.month.test() function in bt.test.r at github. Today I want to show how to use Factor Attribution to boost performance of the 1-Month Reversal Strategy. 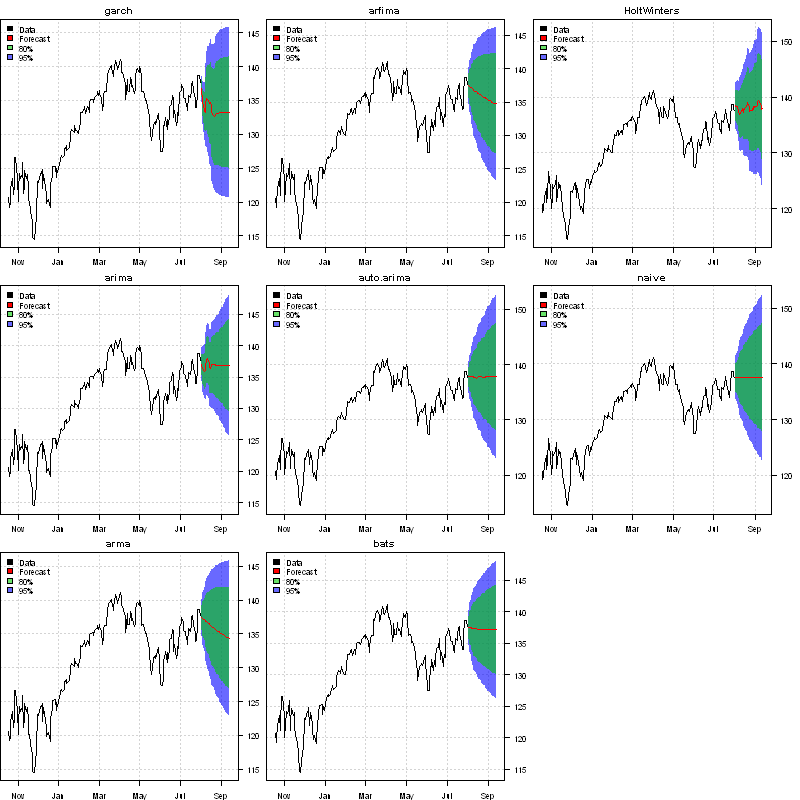 The Short-Term Residual Reversal by D. Blitz, J. Huij, S. Lansdorp, M. Verbeek (2011) paper presents the idea and discusses the results as applied to US stock market since 1929. 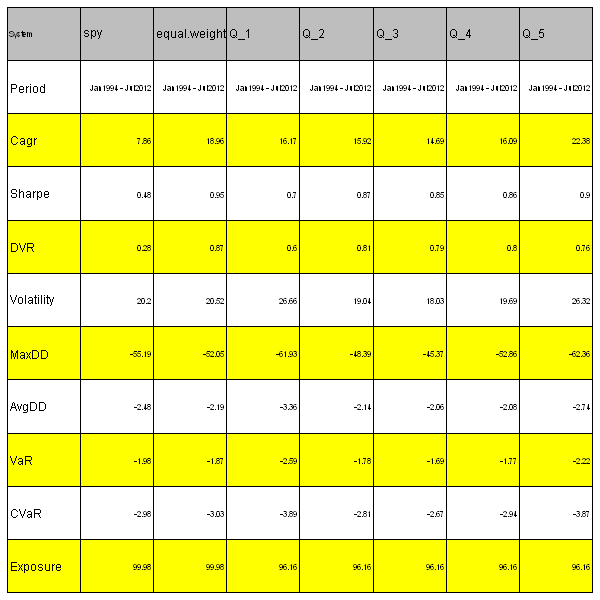 To improve 1-Month Reversal Strategy performance authors investigate an alternative position ranking metric based on the residuals from the rolling Factor Attribution regression. Next let’s run Factor Attribution on each the stocks in the S&P 500 index to determine it’s alternative position ranking metric. I will save both e.T and e.T / standard deviation of (e) metrics. Next let’s group stocks into Quantiles based on 1-Month Reversal factors and create reports. The 1-Month Residual Reversal Strategy have done well over the last 10 years and handsomely outperformed the base 1-Month Reversal Strategy. To view the complete source code for this example, please have a look at the bt.fa.one.month.test() function in bt.test.r at github. Today I want to show a simple example of the 1-Month Reversal Strategy. Each month we will buy 20% of loosers and short sell 20% of winners from the S&P 500 index. The loosers and winners are measured by prior 1-Month returns. I will use this post to set the stage for my next post that will show how Factor Attribution can boost performance of the 1-Month Reversal Strategy. Following is the references for my next post, in case you want to get a flavor, Short-Term Residual Reversal by D. Blitz, J. Huij, S. Lansdorp, M. Verbeek (2011) paper. 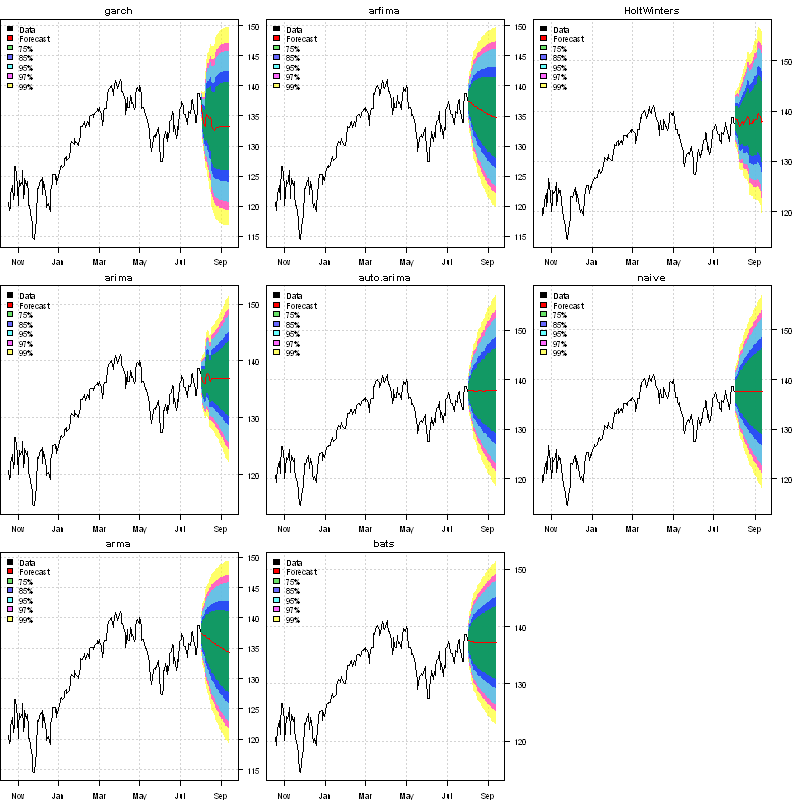 Next let’s group stocks into Quantiles based on 1-Month returns and create back-test for each Quantile. 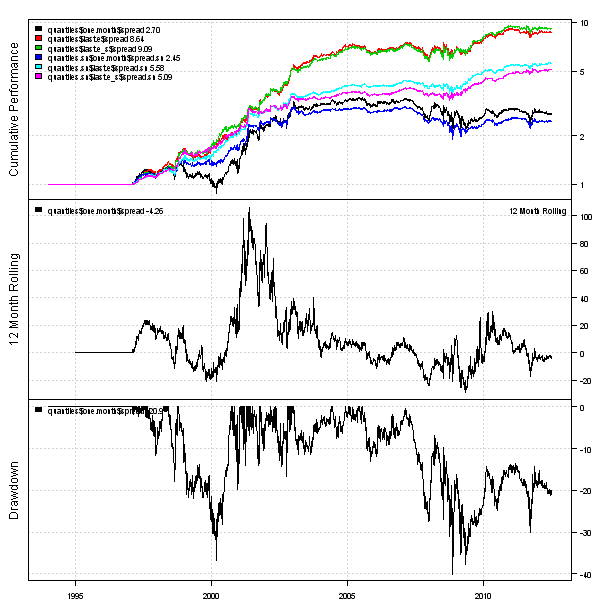 I will rely on the code in the Volatility Quantiles post to create Quantiles. 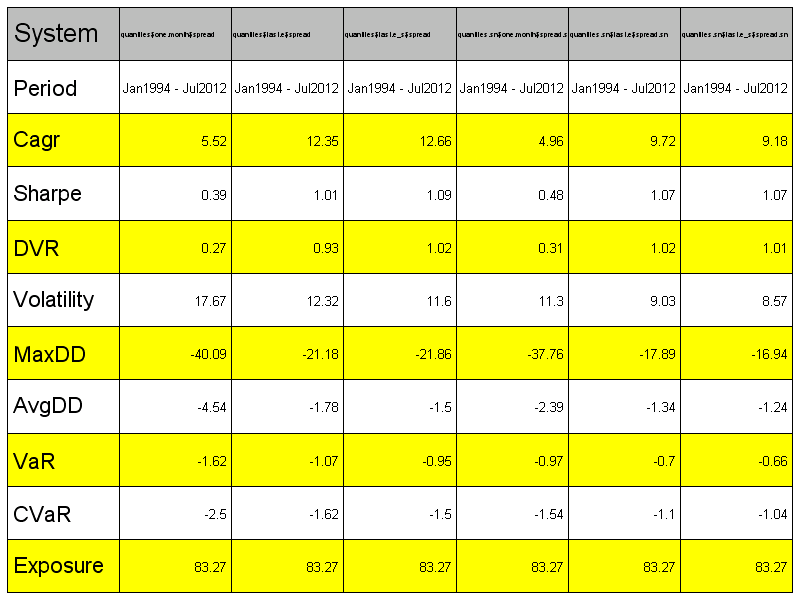 Finally, let’s construct Q1/Q5 spread and create summary performance report. In the next post I will show how Factor Attribution can boost performance of the 1-Month Reversal Strategy using the methodology presented in the Short-Term Residual Reversal by D. Blitz, J. Huij, S. Lansdorp, M. Verbeek (2011) paper. To view the complete source code for this example, please have a look at the bt.one.month.test() function in bt.test.r at github. 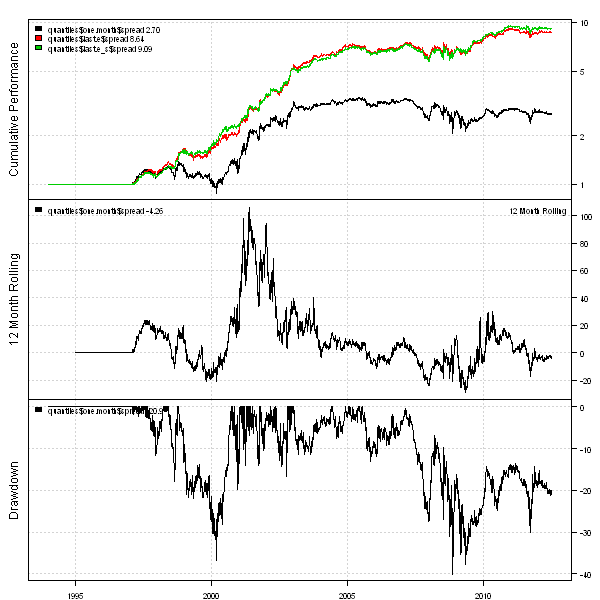 In the prior post, Factor Attribution 2, I have shown how Factor Attribution can be applied to decompose fund’s returns in to Market, Capitalization, and Value factors, the “three-factor model” of Fama and French. Today, I want to show you a different application of Factor Attribution. 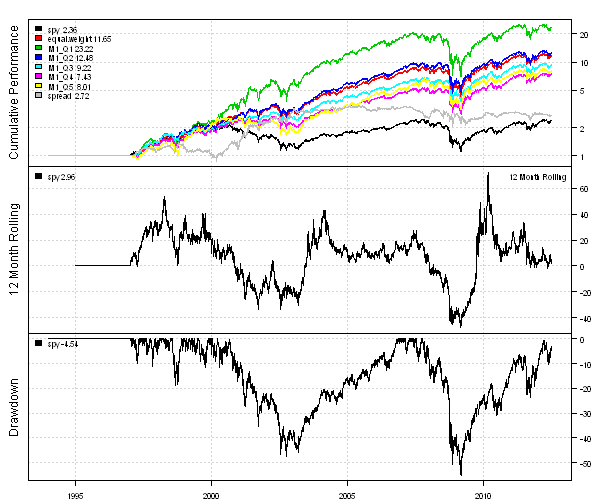 First, let’s run Factor Attribution on each the stocks in the S&P 500 to determine it’s Value exposure. 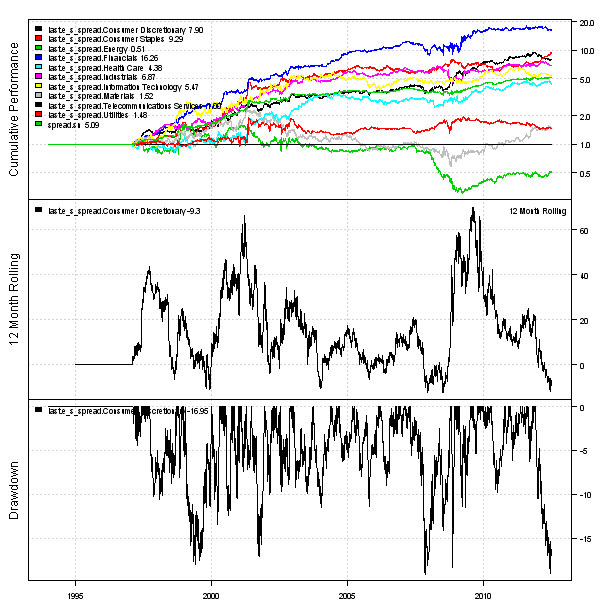 Next let’s group stocks into Quantiles based on Value exposure and create back-test for each Quantile. 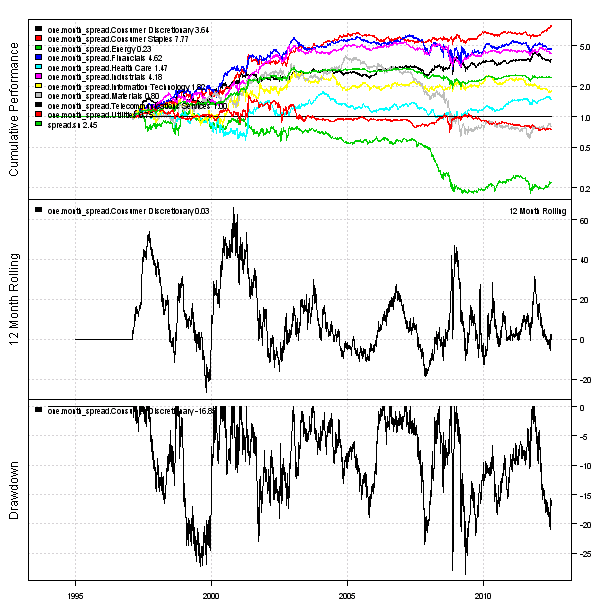 I will rely on the code in the Volatility Quantiles post to create Quantiles. 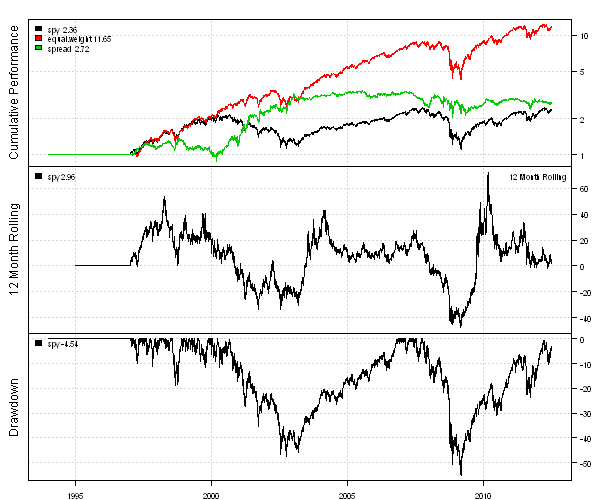 Let’s start by loading historical prices for all current components of the S&P 500 index. Next let’s run Factor Attribution on each the stocks in the S&P 500 to determine it’s Value exposure. 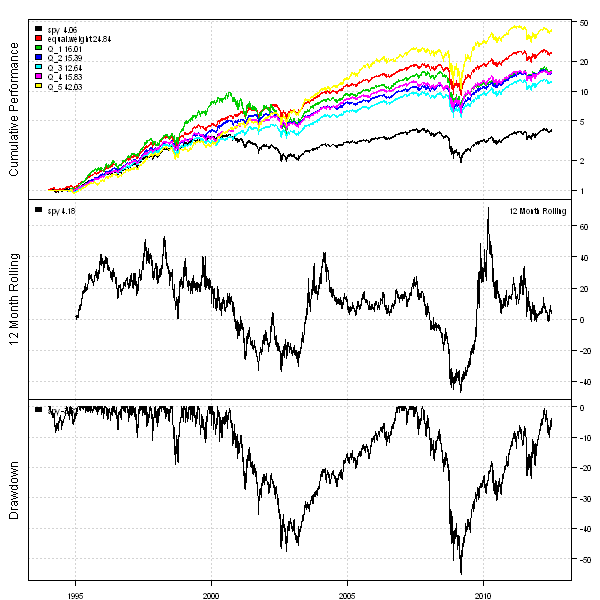 Finally, let’s group stocks into Quantiles based on Value exposure and create back-test for each Quantile. There is no linear relationship between Value Quantiles and historical performance. I’m also suspecting that that implied Value exposure might be quite different than the real Price/Book ratio for each stock. Let me know what do you think about this approach. In the next post I will show another example of Factor Attribution. To view the complete source code for this example, please have a look at the bt.fa.value.quantiles.test() function in bt.test.r at github.